A deadly explosion in Guizhou’s Kaili city is being investigated as a criminal case. Chinese state media are reporting than an explosion in Guizhou province has killed 14 and injured seven. The explosion took place in Laoshan village in Kaili city in southeastern Guizhou. Xinhua noted that the explosion occurred at around 2:30 pm. By 8:30 pm, media outlets such as Phoenix News [Chinese] were reporting that all injured were receiving hospital treatment. Guizhou’s Party Chief Zhao Kezhi and Governor Chen Min’er have already urged local authorities to exert the utmost efforts to tend to the wounded and investigate the incident. The investigation could be interesting. Global Times reported that the explosion was “a man-made criminal case,” hinting that the explosion was purposeful. If so, Laoshan village would become part of an unhappy but growing number of cities that have suffered from a violent bombing. Besides numerous reports of terrorist incidents in China’s Xinjiang province, there have also been recent bombings in Taiyuan, the capital of Shanxi province, and in Beijing’s international airport. While violence in Kashgar is generally described as the result of coordinated terrorist attacks, the bombs in Beijing and Taiyuan were allegedly set off by sole actors. The Beijing airport bomb was set off by a long-time petitioner, Ji Zhongxing, who was trying to draw attention to his grievance. The explosion resulted in slight injuries to Ji and one policeman. The Taiyuan bombing, which killed one and injured eight, was described as the work of a previously convicted thief, Feng Zhijun, who wanted to “get revenged on society.” Such bombings, whether by groups or individuals, are swiftly investigated and prosecuted as part of China’s emphasis on ensuring social stability. Expect a similar response here, as the local authorities seek to bring the case to a quick conclusion. The exact location of the explosion in Kaili in unverified, although the Global Times reported that it was rumored to have taken place in a gambling den. Once the site of the explosion is made public, it could imply a motive for the alleged attack. Guizhou is one of China’s poorest provinces, and has made a tourism push [Chinese] part of its development strategy. Kaili city, part of the Qiandongnan Miao and Dong Autonomous Prefecture, is an important part of this strategy. 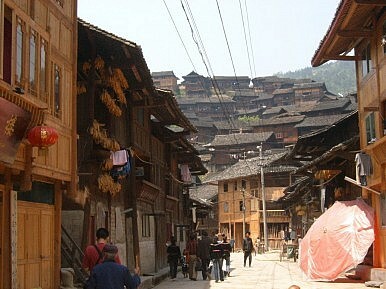 Kaili has a large population of the Miao ethnic group, meaning there are numerous Miao villages and festivals to attract tourists. Well-known travel guide Fodor’s, for example, recommended Kaili as “the starting point for a journey to the Miao and Dong villages” of eastern Guizhou.